When defined by distinctive biological terms, the difference between fruits and nuts would actually be nothing. Surprised? While there are many obvious differences, the scientific community considers a nut to be the same as a fruit, at least the outer shell of the nut is the fruit. The definition of a fruit is simply stated as the distinctive mature ovary of any flower, plant, or tree, that contains seeds. Since the nut that we eat is technically a seed, the outer layer (shell) is considered to be the fruit. When establishing the difference between fruits and nuts, it’s also important to realize that we tend to confuse nuts with legumes (peanuts), or drupes (coconuts and almonds). To use the simplest definition of a nut, it is a fruit that is filled with only one seed, that also has a hard outer shell that typically doesn’t split, or fall off, when the nut ripens. Fruits that we commonly associate with the fruit family are likely to either be soft or tender, rather than the hard crispiness of a nut. Not all nuts have the potential to grow into a plant or a tree, but the seeds that are within a fruit have the potential to flourish as a fruit-bearing plant. Of course, one of the biggest and most obvious differences, is how we use each food. Fruits generally have juices, and we use these juices in order to drink healthy drinks that are loaded with vitamins, antioxidants, and minerals. Nuts also have vitamins, antioxidants, and minerals, but are lacking in juice, and are not typically considered something that could be turned into a tasty liquid. From cooking to snacking to baking, we use nuts and fruits in different ways. While it’s not uncommon to mix fruits and nuts, we usually have a dominant flavor that caters to the taste of the dish. If we’re leaning toward sweet, we use a greater proportion of fruit. If we are creating savory or salty dishes, nut flavors reign supreme. People who are allergic to nuts are not conditionally susceptible to being allergic to fruit. However, those who are allergic to fruit are, in fact, conditionally susceptible to nut allergies. Of course, there are no determining factors that would describe whether people who are not allergic to fruits or nuts, are more or less likely to enjoy the taste of either. Noa A. "Difference Between Fruits and Nuts." DifferenceBetween.net. 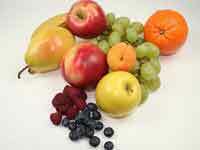 June 14, 2011 < http://www.differencebetween.net/object/comparisons-of-food-items/difference-between-fruits-and-nuts/ >.